Super Mario 3D is exactly what Mario fans want. For a lifelong gamer, there are few things as comforting and familiar as a new Super Mario game. Yes, Nintendo has found new ways to innovate and evolve the series over nearly three decades, but gamers still know what to expect when the next entry in the series comes around. With Super Mario 3D for the 3DS, the series combines the 3D platforming of Super Mario 64 and Super Mario Galaxy with actual three-dimensional visuals, and playing it outside of the Nokia Theater earlier today felt like meeting an old friend. With only a handful of areas available for the demo, I decided to jump to the third world of the game, which transported me to an level among the clouds. Using some of the gameplay mechanics seen in the Mario Galaxy games, I maneuvered my way through disappearing platforms until I landed safely on solid ground. I thought that I would be able to beat the level with my hands tied behind my back, but adjusting to 3DS controls on a three-dimensional playing field offered more of a challenge than expected. Using the analog nub to control Mario, I couldn't always tell where he was going to land, sometimes taking leaps of faith and hoping for the best. Once I got acclimated to the control scheme, I was able to enjoy the fun but tricky level design, which is what defines a good Mario game. I found blocks that teleported me from one platform to another rather than spitting out coins, hidden items off the beaten path, and of course, that Tanooki suit sure to bring a smile to the face of any gamer who was alive during the heyday of Super Mario Bros. 3. Instead of flying high, the suit allows Mario to hover briefly in the air, which can be used to reach secret collectables or for extra precision when landing. For bottomless levels where missing a jump can mean instant death (like the one I was playing), being able to hover in the air for a few extra seconds can mean the difference between success and failure. Of course, because the game is on the 3DS, the option to play in actual 3D just enhances the experience. In 2D, the game looks exactly as you would expect: bright, full of primary colors, and full of funny-looking enemies and various floating blocks. Other than the Tanooki suit, there wasn't anything particularly distinctive about it, even though the visuals were very inviting. Being able to experience the game in 3D is what really gives it something extra and makes it stand out, no pun intended. 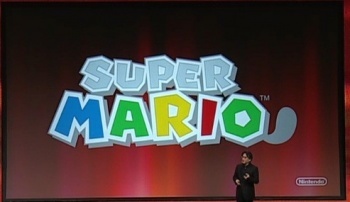 Super Mario 3D also makes use of the touch screen by allowing you to access power-ups by simply touching them. One level is hardly enough content by which to judge an entire game, but from that experience I can safely say that Super Mario 3D feels like a Mario game. It's familiar and accessible while also being different and challenging, and hopping on that flagpole at the end of the level was extremely satisfying. As the type of gamer described above-a lifelong fan of the industry who started with Super Mario Bros. - Super Mario 3D appears to be exactly what I want, and I'm very much looking forward to playing it endlessly when it launches later this year.